Facebook's Advertising Tools Complicate Efforts To Stop Russian Interference : All Tech Considered Facebook says 126 million people may have seen Russian content aimed at influencing Americans. Marketing gurus say Facebook is unlikely to solve the problem because of its ad-based business model. Unlike traditional ad buying, Facebook's ad platform is self-service and automated, says Marty Weintraub, a marketing executive with the firm Aimclear. All an advertiser needs is a valid email address and a credit card. Facebook's ad targeting software does the rest. But several marketers say that Facebook's cutting edge technology also allows scams, fake news and foreign interference to slip through the cracks, and seamlessly go viral. The less subtle and the more viral the content, the more users engage and the better for Facebook's bottom line. In the words of one Wall Street Journal writer, "If it's outrageous, it's contagious." While Facebook is under political pressure to clean up shop, Weintraub says, it's under far greater financial pressure to remain wide open. "It's their revenue their dealing with, so it's not like they made a team of people from the NSA and said: lock this puppy down," Weintraub says. His firm's clients range from members of Congress promoting political campaigns to luxury brands marketing cars and handbags on Facebook. Weintraub and his team demonstrate on his computer how to tailor an ad for a narrowly targeted audience. They start with the term "expats" — people who start their account in one country and then live in another. It's a useful way to target immigrants — say for English language classes; or for a green card scam. Aimclear, a marketing agency, created this ad search term for green card fraud to demonstrate how Facebook ads can be targeted to certain users. 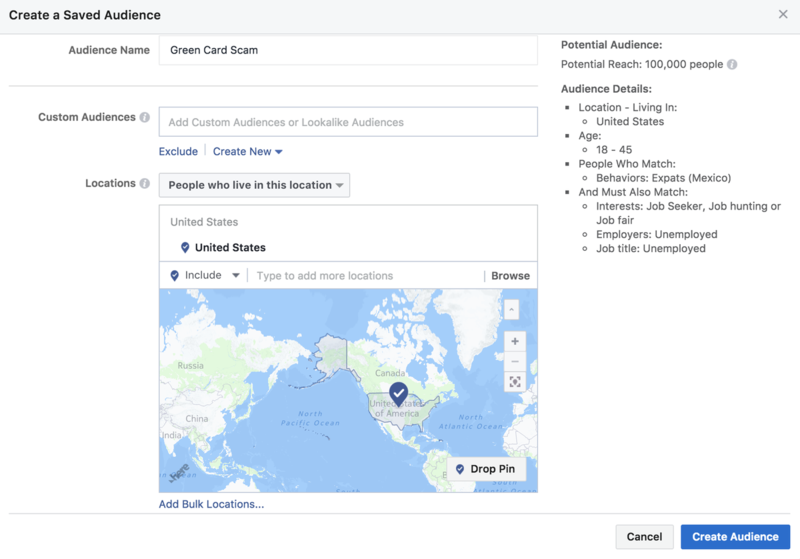 By adding user characteristics that Facebook tracks — country of origin, education level, interest in U.S. citizenship — an advertiser could, within minutes, build a target audience of people who are vulnerable, desperate and most likely to fall for a headline that reads: Get a green card for $400. Facebook has made changes in response to the revelations about Russia's election interference. But they've typically been at the margins. Facebook doesn't require every advertiser to show ID; but it does zap terms here and there. If you want to reach white supremacists, you can no longer target people with an interest in the KKK and David Duke. But you can still reach a similar audience by targeting those interested in certain racial conspiracy theories. It's a game of whack-a-mole. "The sharpest marketers in the world are going to find a way around any targeting system or redaction," Weintraub says. Facebook says it's hiring more than 4,000 people to weed out fake accounts and violators. Still, company engineers are aggressively building new tools and enhancements that could make it far worse. Consider lookalike audiences. If an advertiser wants to target far-left extremists in California, she can just take an email list built from a rally attendance roster or from the cookies trackers of a far-left website and then feed it to the ad platform. The software does the rest, identifying more extremists without the advertiser having to say that's what she's looking for. "It's a total blind. Facebook has no idea what targeting it's providing you with," Weintraub says. 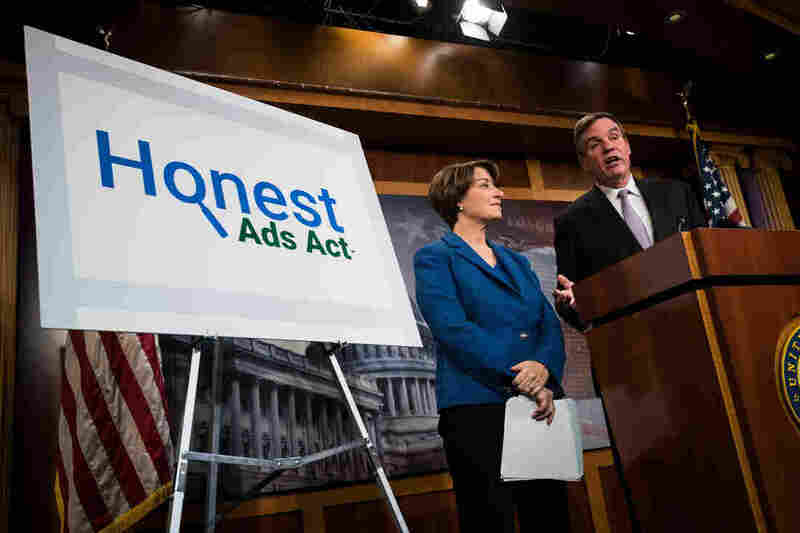 This week lawyers from Facebook, Google and Twitter will speak to Congress. Weintraub worries that lawmakers will get stuck in abstract policy debates, and not dig into advertising — the core of the business. "The tools are way deeper than you folks have even scratched the surface of," he wants to tell lawmakers. "You have no idea what you're dealing with here." Facebook plans to begin labeling ads as paid content, so it's clear to users; and the company is regularly removing extremist interests — like KKK — from the advertising bucket. A spokesperson says it's important to remember all the good that people promote through Facebook advertising — everything from disaster relief efforts to locally owned businesses.